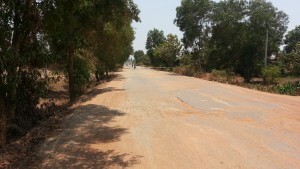 I have provided information about Siem Reap here. 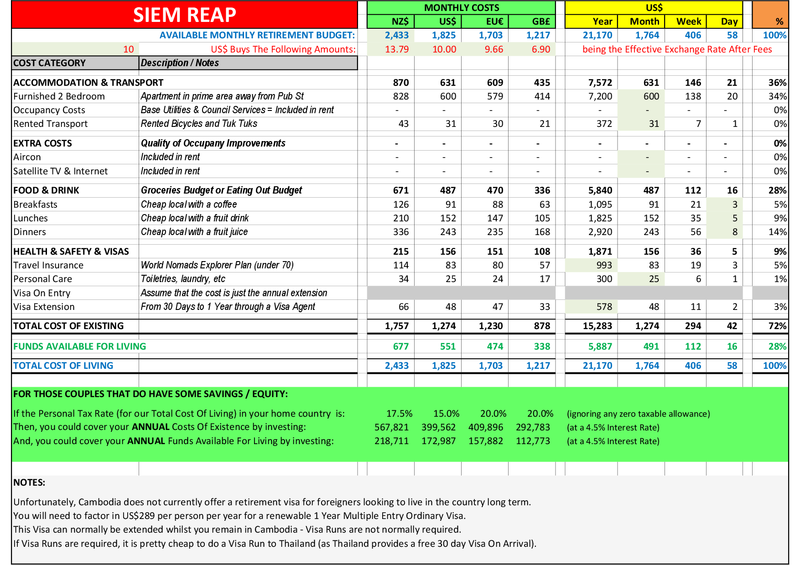 I have also provided information on how much it would cost 2 GRANDPAckers to visit Siem Reap to investigate their retirement options here. I will not duplicate that information on this page. 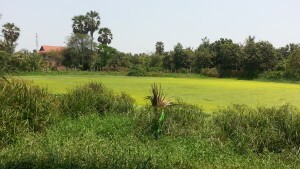 Here, I will focus on Siem Reap as a Retirement Location. 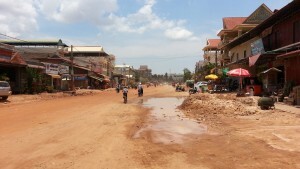 Siem Reap is not a place for the faint-hearted. It lacks the sophistication that you find in, say, Malaysia. 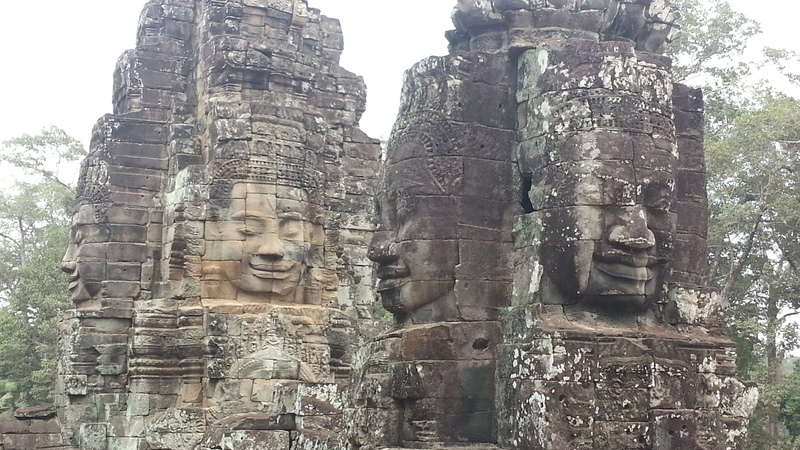 Siem Reap is for the more open minded and the more adventurous. Corruption and nepotism are rife. It’s not ‘what you know’, it is ‘who you know’. There are regular power cuts and the people ‘in the know’ are on the ‘royal grid’; which means that if there is any generator / back up power, they get it. It doesn’t matter where they are… they could be in the middle of your street and be the only house in sight that still has their lights on. Power can be out all night for several days in a row. 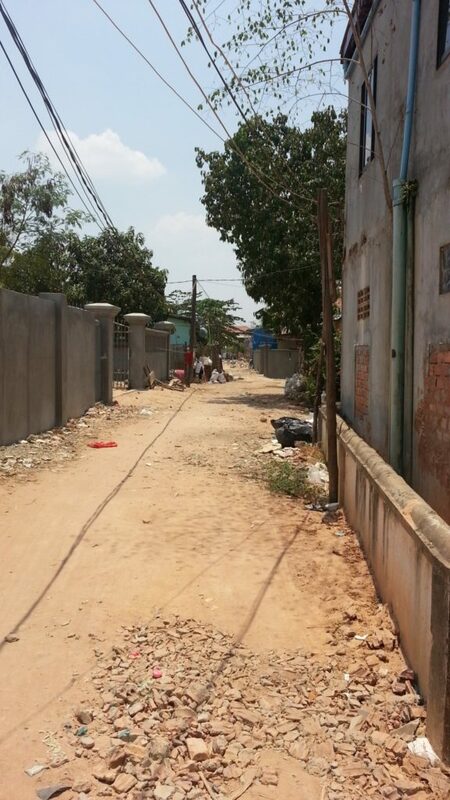 Dirt streets and alleyways make up the suburbs. Scroungers rifle the rubbish for anything of value (like tin cans and plastic bottles). Rubbish litters the streets awaiting collection. Residue stays on the sides of the streets indefinitely. But, as a Retirement Location, Siem Reap benefits from the constant high volume churn of tourists who come to see Angkor Wat. As such, there are plenty of facilities to service these tourists and, therefore, you. 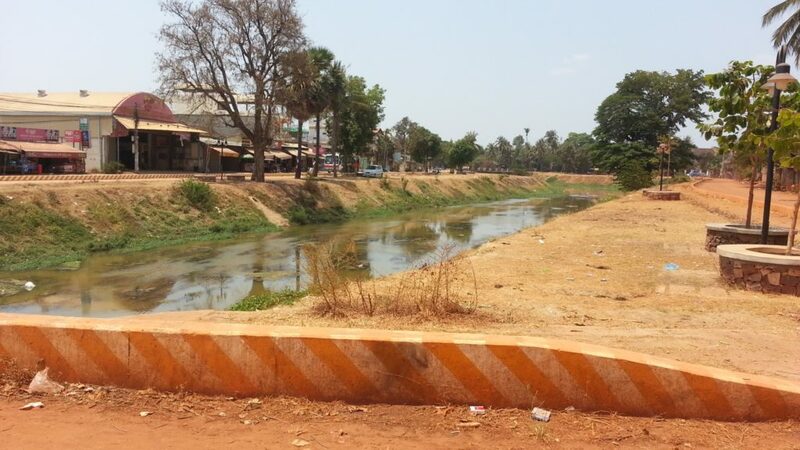 As tourism is so important to Siem Reap (and Cambodia), the Government have spent a lot of effort ‘cleaning it up’ and Siem Reap is now a pretty safe place to be. Anyone getting on the bandwagon now will see things get better and better. Personally, I would rent – not buy. There are many Kymer quality rental properties out from the town centre. Two bedroom furnished homes can be found for US$200-300 / month. You will need to pay Cable TV (US$5 / month), WiFi (US$5 / month) and Electric (average US$100 / month) on top of that. There are not really any expat ‘gated communities’ in Siem Reap. It is too common for expat homes in the suburbs to be burgled; just because you have a guard, don’t think that you are safe… too often, the guard is ‘in on it’ and was ‘asleep’ when the burglary occurred. I would NOT advise people to start out in the suburbs. Start in the centre of town and look to the suburbs once you have carefully studied your options and have gotten to know the lay of the land. A quality, 1000sqft, modern, well built, furnished, 2 bedroom modern apartment should cost you about US$600 / month inclusive of water, WiFi, Cable TV, and electric. In Cambodia, it is important to get a well built rental property as (even though the Landlord is responsible on paper and contractually) maintenance will never get done – you will need to sort it out yourself at your own cost. The going rate for a cleaner to come in once a week is US$28 / month. For that money, they ‘blitz’ the whole house top to bottom. You can find apartments for US$400-$500 but they tend to be of a lesser build quality, so check them out thoroughly first. 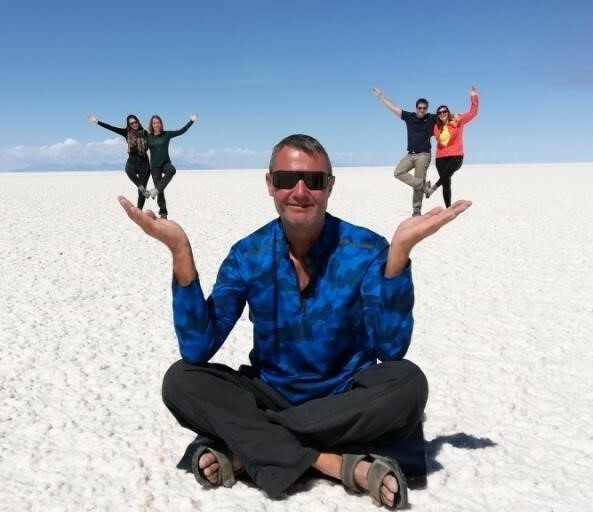 You can easily find a Double Room with fan, Cable TV, and hot water shower in a reasonable Hostel or Guesthouse within walking distance of the Pub Street area for US$10 / night. For US$20 a night, you can get something very comfortable. I would go around town and find the nicest room that I could find being quoted at US$20 / night. Once found, I would get out US$300 in cash put it in front of the owner and say ‘US$300 / month’. Confronted with this option, many owners would take it. Then, you can stay there for a couple of months until you find the right long term rental apartment that you are looking for. If you manage to get GRANDPAcking accommodation in or around the centre, then you will be able to get by on foot and by renting (or buying) a couple of bicycles. You should be able to long-term-rent a bicycle for peanuts – target NO MORE THAN US$0.50c / day. Buying could prove the better option. As a rule of thumb, Motos are half the price of a Tuk Tuk but a Tuk Tuk can take both of you. 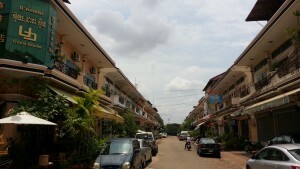 IS SIEM REAP A GRANDPACKING RETIREMENT LOCATION? YES. IT IS STRONGLY SUGGESTED, that you come and spend a few months here BEFORE making any commitments. Changes to the Thai Visa system has resulted in many undesirable expats (from places like Phucket and Pattaya) heading for new hunting grounds. Unfortunately, Siem Reap (and Sihanoukeville) is one of those places. You will need to adapt to a different culture and the ways that things get done. If you are the sort of person to get annoyed by someone driving the wrong way up your side of the street (and expecting to take priority over you on your bicycle)… you’re not going to like Cambodia very much. However, Siem Reap benefits hugely from the foot traffic generated by Angkor Wat. It is this foot traffic that helps the government and the locals to make the improvements necessary to make it desirable to live here on a long term basis. You have a plethora of restaurant and bar options to choose from. There is always something going on. The place is being ‘tidied up’, it has much less crime than places like Sihanoukville, and the ‘seedy side’ of Cambodia is being brought under control. 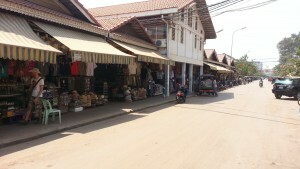 I think that Siem Reap will improve as a Retirement Option year-on-year as the place matures. From an affordability perspective, Siem Reap is let down by its higher-than-average accommodation costs and them annual visa cost.